This will be a multipart series on how to use a digital compass(magnetometer) with your Raspberry Pi. The magnetometer used in these tutorials is a LSM9DS0 which is on a BerryIMU. We will also point out where some of the information can be found in the Datasheet for the LSM9DS0. This will help you understand how the LSM9DS0 works. The math and logic in this series can also be used with other magnetometers or IMUs. We will also go over how to do some basic communication on the i2c bus. As well as using SDL to display the compass heading as traditional compass as shown in the video above. The code for this guide can be found under the compass_tutorial01_basics directory. A traditional Magnetic compass (as opposed to a gyroscopic compass) consists of a small, lightweight magnet balanced on a nearly frictionless pivot point. The magnet is generally called a needle. The Earth’s Magnetic field will cause the needle to point to the North Pole. To be more accurate, the needle points to the Magnetic North. The angle difference between true North and the Magnetic North is called declination. Declination is different in different locations. This angle varies depending on position on the Earth's surface, and changes over time. The strength of the earth's magnetic field is about 0.5 to 0.6 gauss . 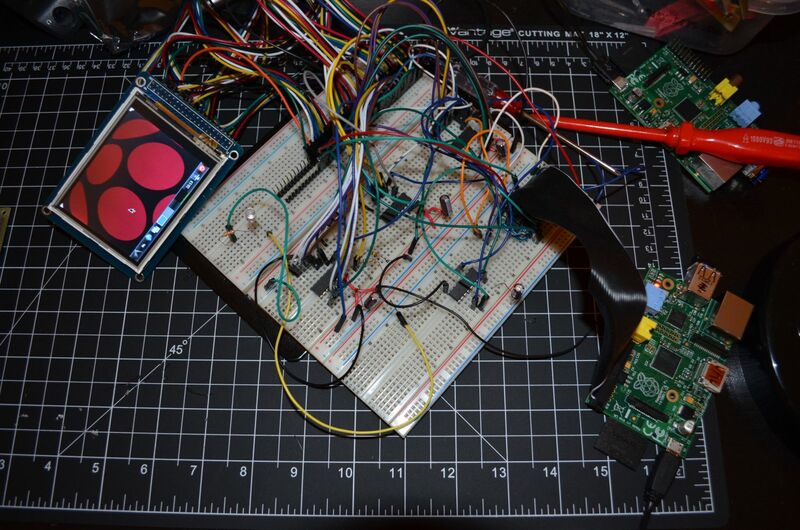 In this post I demonstrate how to use an infrared remote to control the GPIO on a Raspberry Pi. Normally a remote would be used to control a TV card or XMBC, however they also provide a good interface to control the GPIO on a Raspberry Pi. Adafruit has a Mini Remote and IR sensor which are perfect for this. 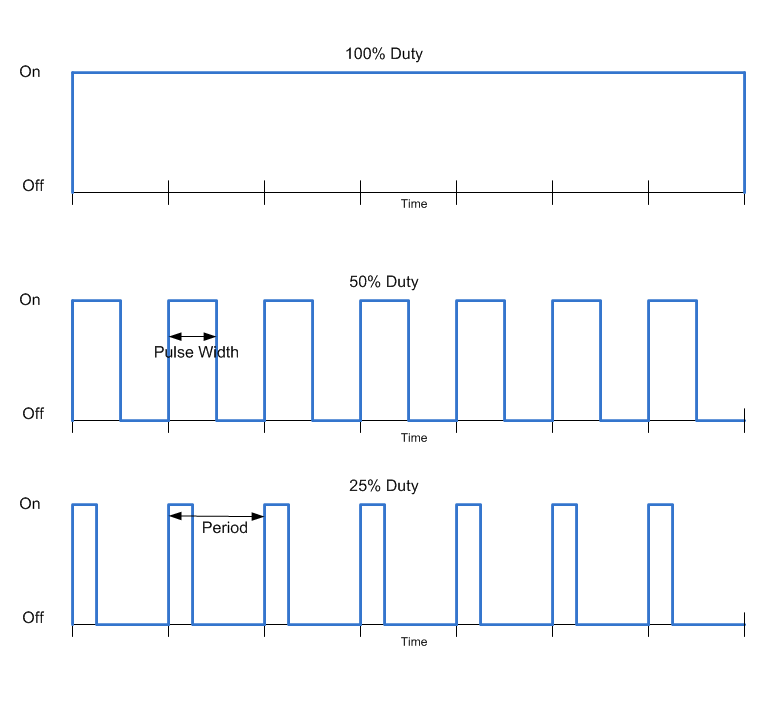 In this example we will use the remote to control a number of LEDs connected to some GPIOs on a Raspberry Pi. 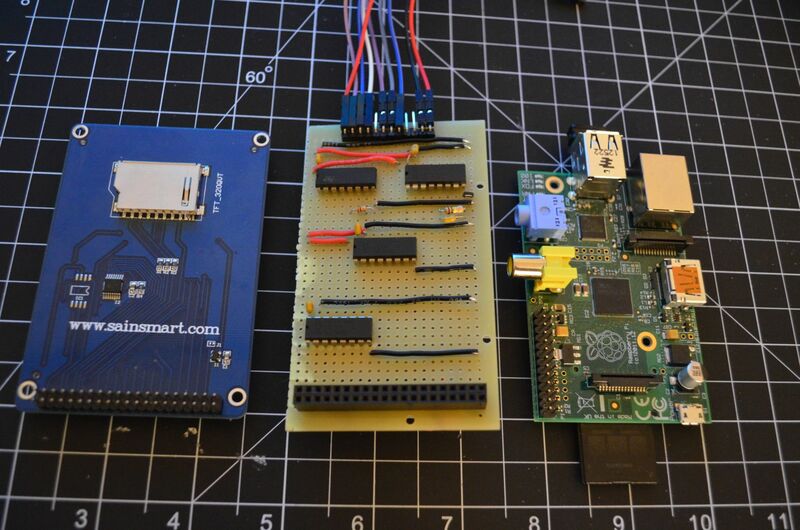 Connecting the IR sensor to a Raspberry Pi is very easy as there are only 3 pins on the sensor, GND, 3v and Output. We will connect the output to GPIO 18. You can choose another pin, just take note of it as you will need to specify this pin when installing LIRC. We will also connected up three LEDs to GPIOs 23, 24 & 25, and a 270Ω on the GND sound of each LED. In this post I’ll show how to connect and use a 16 x 2 LCD on a Raspberry Pi. 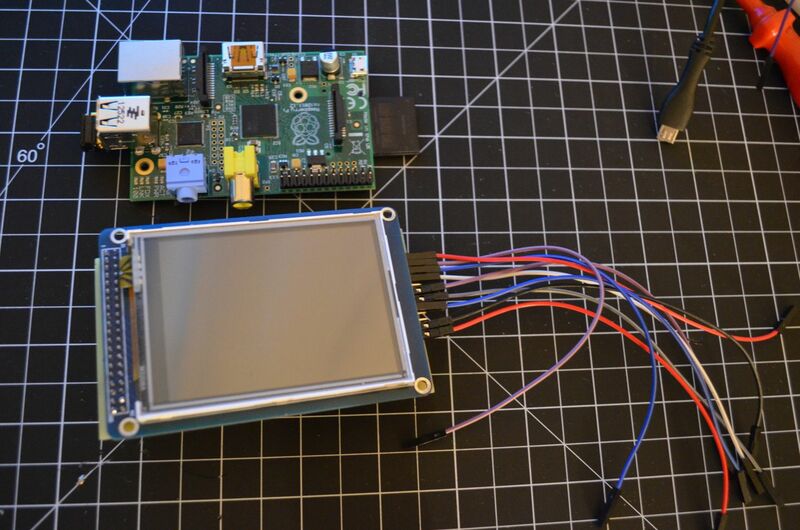 The LCD I am using is a Blue Character OLED(LCD) 16x2 from adafruit. This display has ultra-high contrast and any-angle readability. It has the best display I have seen on any LCD. This LCD uses the HD44780 controller which is present in almost all LCDs. LCDs that use this controller usually have 14 or 16 pins. This LCD has 16, numbered from 0 to 16 as shown below. Sometimes these pins are present, but not used. Eg, pins 15 & 16 are for back-light and they are not used on this LCD. It depends on the manufacture. Pin 3 Is usually connected to a potentiometer to control the contrast of the display. Pin 4 The register select signal (RS) determines whether the Data Bit values are interpreted as a command (E.g. clear screen) or data (aka: a character to display). Pin 5 Is the Read/Write pin. In read mode, this pin is used to get feedback from the LCD to work out if the LCD can accept commands or to indicate it is too busy. We don’t need this function as we can wait the maximum time for a command to be written (200us) before sending the next command. 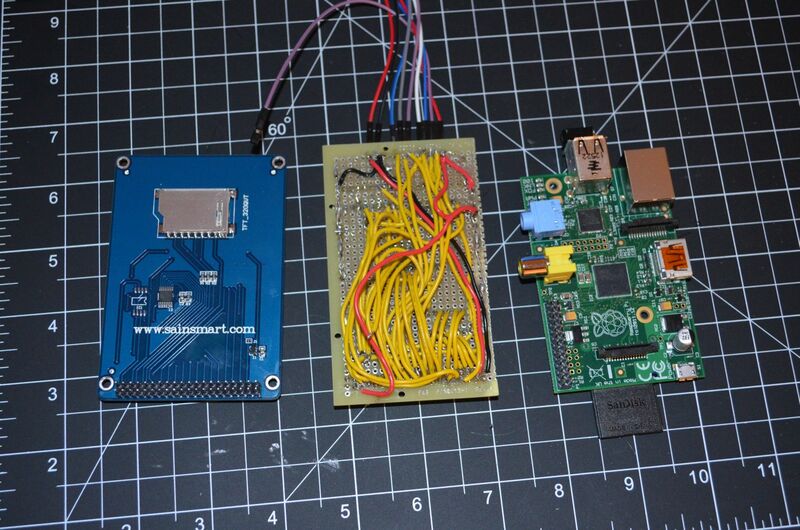 If read is enabled and Pin4 on the LCD is connected to a pin on your Raspberry Pi, there is a chance that you can destroy your Pi. We only ever want to write to the LCD, we never want to read from it. So this should always be connected to ground. 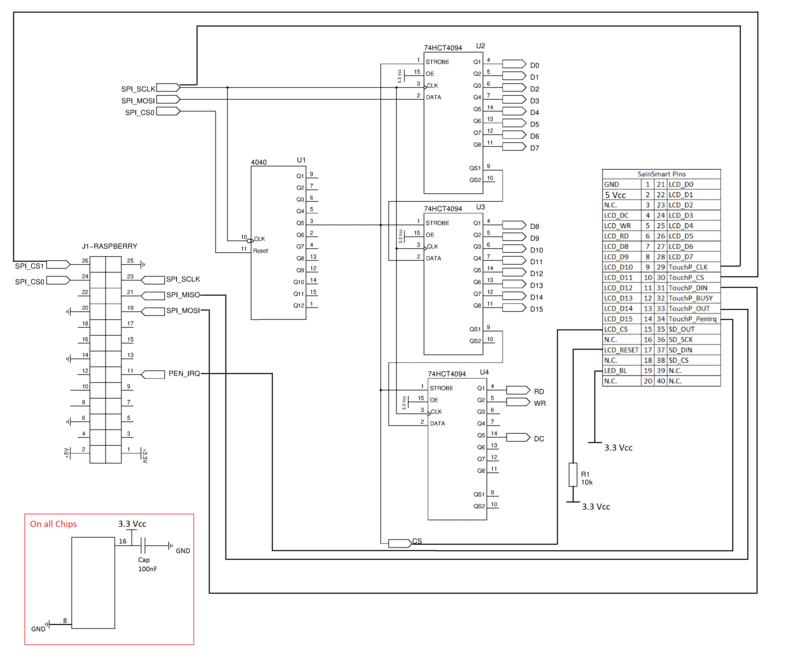 Meaning, when this pin goes low, the LCD will take the input from the data pins at this time. Pins 7 to 14 Are the data pins. In 4 pin mode, only pins 11 to 14 are used. Pins 15 & 16 Are used for the backlight if present. 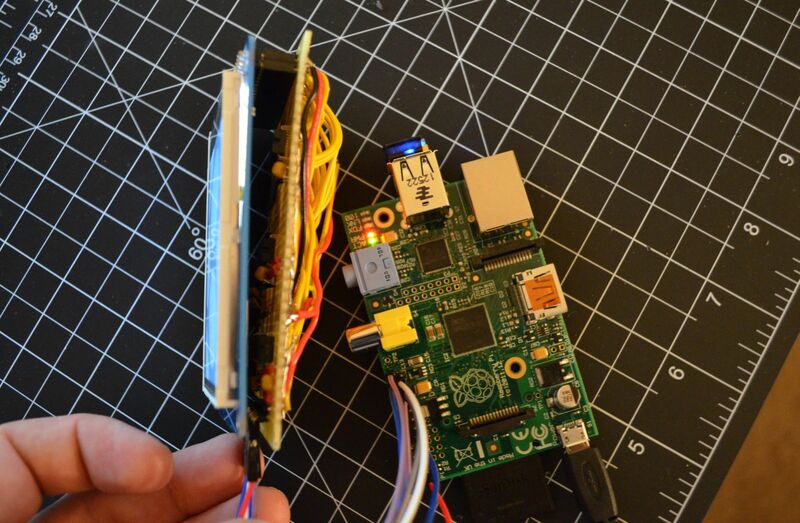 Below shows how to wire up the LCD to the Raspberry Pi. We will be using 4 pin mode, so there is no need to connect pins 7 to 10. This LCD doesn't use the backlight pins, pins 15 and 16. It also doesn't use the contrast pin, pin 3. 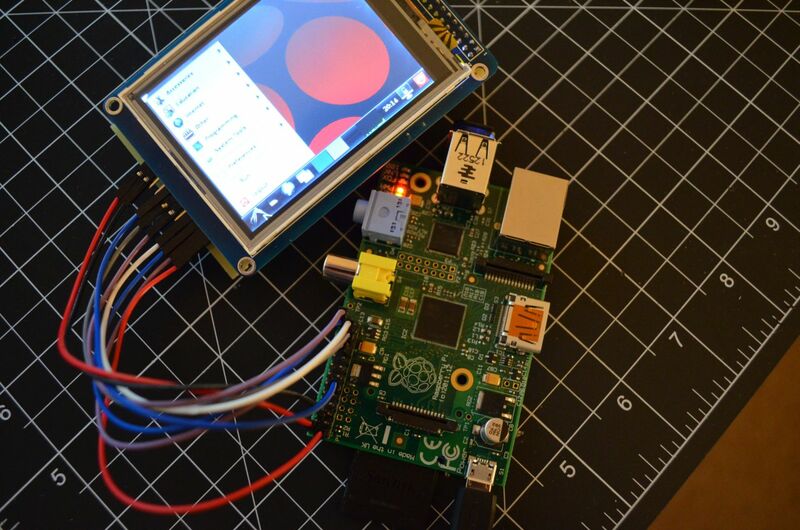 In this post I show how to control the GPIO on a Raspberry Pi using a touchscreen. In the above code touchbuttons.c creates three buttons on the TFT which will be used to turn on/off three LEDs. This can easily be changed to add more buttons. To accept input from a touchscreen we have to use the event interface of the Linux input system. We use the ioctl capabilities of the event interface, in addition to the normal read and write calls to get information from the touchscreen. 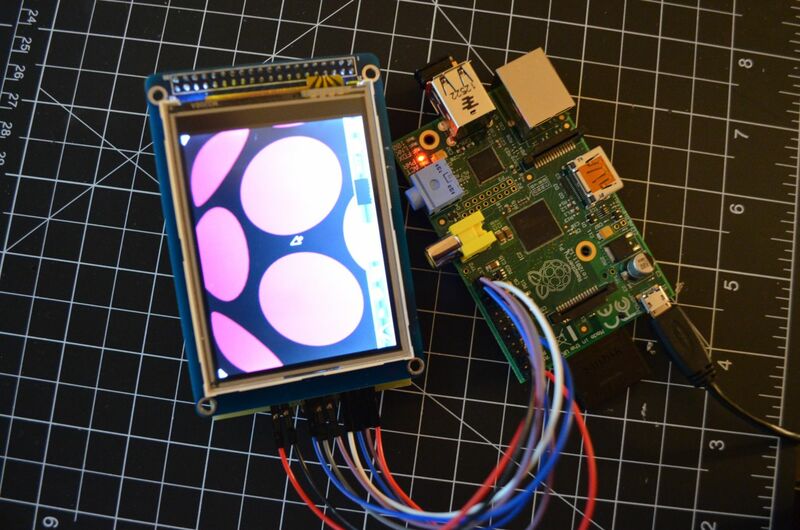 This blog post explains how to use the touchscreen within your own programs using C as well as writing directly to the framebuffer. I have spend the last month creating a new version of PiBBOT (Pi Balancing roBOT) , PiBBOT V2. This version has a sturdier frame and a LCD display. I replaced the 1.8" TFT with a LCD as the TFT was causing delays in the main loop timing. I also added a very slim battery for the Raspberry Pi. RGB backlight LCD 20x4 which shows gyro, accelerometer and complimentary filter angle. Volt Meter to view condition of battery used for motors. RF Receiver RF M4 Receiver - 315MHz. Used to tune PID and then control direction. 1x4 Keypad to turn motors on/off and to reset the gyro. I have come up with a more permanent solution for my 3.2 Touch screen. Download the Kernel that contains the drivers. I used a prototype cut down to the size of the Pi and 3.2" TFT. And then did a lot of soldering. I have spent the last few weeks working on getting a SainSmart 3.2" TFT with touch control working with my Raspberry Pi and I have had success. I have currently connected it up with a breadboard, I now need to work on a more permanent solution. Below I will outline how to automatically log into your Raspberry Pi from a Windows PC using Putty. This requires the setup of SSH keys, which is very easy to do. Download Puttygen from here and run it. Once open, click on Generate and move your mouse around to generate your SSH keys. Copy and past the public key, which is shown at the top of Puttygen into notepad, we will use this later.